I’m a novelist married to a classical figurative sculptor. This comes with intense pressure, as independent careers do, especially today. Essentially, Sabin and I are entrepreneurs running small businesses. I’ve blogged before about the unceasing demands of the independent artist’s journey. We do it because we must, because it’s who we are. We do it hoping to reach and to serve a larger audience with our talents, not just for financial gain, but because it is the ultimate fulfillment of talent to be used in service to a larger cause. 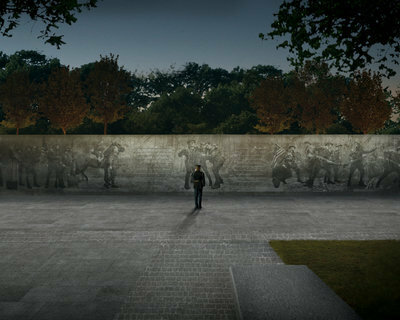 Last spring, Justin Shubow of the National Civic Art Society sent Sabin notice of an open design competition for the National World War 1 Memorial in Pershing Park in Washington D.C.
Sabin was intrigued and he’s ambitious and he liked the historical richness of the project. Sabin’s dad, before he retired, taught history in high school; his mom was a tenured professor of Chinese history at Rutgers. The study of history runs in Sabin’s blood. “That’s what I want to do: sculpt monuments,” he told me. He contacted a well-known classical architect. They created a beautiful design. There were over three hundred sixty anonymous submissions, of which five were selected. Sabin’s was not one of them. “Next,” Sabin said, shrugging. I knew he was disappointed but Sabin is one to carry on. “I’d better call him right now,” Sabin said. Later Joe told Sabin that he’d researched dozens of sculptors, but he threw out his list when he saw Sabin’s work online. He knew he wanted Sabin on his project. So Sabin worked with Joe Weishaar, a wunderkind in Chicago with a gift for design. They spent hours on the phone. Joe wanted walls with reliefs as well as a sculpture in the round in his design, to tell the story of the war. Sabin came up with the idea for the content of the bronze reliefs and the sculpture. In the way that wives do, I tagged along for the ride. Sabin researched the Great War as he made drawings for the reliefs. We saw the evocative film Testament to Youth based on Vera Brittain’s book. We scoured Netflix for documentaries and watched 14 – Diaries of the Great War, an international documentary drama series that showed the vastness and sweep of the war from a human perspective. Sabin assigned the reading to me. Dinner conversations revolved around trench warfare, poisonous gasses, and the psychic devastation of a whole generation of bright young men lost to the war. Sabin contacted costume and antique shops, looking for authentic WW1 uniforms. He hired models and a photographer to shoot photos from which he made the relief drawings. Our research indicated that horses were essential to this war, so Sabin took a model and the photographer to a stable upstate. He wanted more than one soldier in the image so he donned a uniform himself and gripped the horse’s reins. I took special pride in watching my husband work so diligently. The purpose of this memorial is to commemorate the over 4,000,000 American men and women who served in uniform during the Great War and the over 116,000 Americans who gave their lives in it, and to educate the public about the war and its far-reaching effects. It mattered to me because my father was career military. He was a submarine sailor and a Chief in the U.S. Navy. I grew up with two knowings: one is that military service is honorable service to our country, and two is that it means that sometimes lives are lost. My father never saw combat, but we knew about the USS Thresher, a sub that went down at sea. It is psychologically wholesome for military personnel, not just those in uniform but also their families, to know that lives that are lost are not forgotten, but are cherished and remembered. Even if the war was 100 years ago, it matters. Joe and Sabin met with the Design Committee, received input, took that input to heart, and incorporated it. They ended up with a design that is gracefully elegant and simple, that communicates the history of the war in understandable visual images, that makes an emotional impact on viewers, and that incorporates the park as a park. Sabin made it clear to the committee that the content of the reliefs wasn’t fixed but was open to their input. He knew, if they won, that the art work would be adjusted. Yesterday the committee was slated to announce the winner. The competition has been conducted according to ethical standards of transparency, so the morning proceedings included conference call-in capacity for the public to listen in. Sabin and Joe declined but I called in. The first ninety minutes concerned the committee’s business in raising awareness of events from so long ago. It was exciting to hear about national and international outreach efforts, but my heart thundered in my chest as I waited to hear about the competition. Sabin was shipping a sculpture to a client and needed me to sit in the car while he lugged the crate into the shipping office; in New York city, you’re always trying to avoid parking tickets. He returned to the car as the conversation finally turned to the competition. “You might want to listen,” I said breathlessly. I put the call on speakerphone. Someone said that the committee had come to a unanimous decision and the design team that had been selected was Joe Weishaar and Sabin Howard with their design proposal Weight of Sacrifice. His brain churned with ideas for the next step. I sat and gave thanks. Along an artist’s path, there are milestones, and this was a big one for Sabin. We both hope it will be one, as well, for descendants of WW1 veterans, for veterans and the military, and for the public at large.